Cheltenham is known for a number of different reasons, including a number of cultural festivals including music, literature and food celebrations taking place annually. Perhaps its best known asset is the Cheltenham Festival horse racing event, held every March and with a prize second only to that of the Grand National. 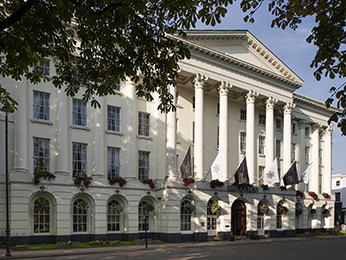 Make the most of your visit by taking your pick from our selection of hotels in Cheltenham below. The horse racing has been an important part of the town since its introduction in 1815, but there's more to the area than that. The Pittville Pump Room, finished in 1830 is a grand building once used to pump mineral water; these days it is a Grade I listed building which often hosts concerts and was at one point part used as a museum of fashion. The Gloucestershire Warwickshire Railway is a faithfully maintained railway that brings historic locomotives back to life, giving a clear idea of how transport would have been 50 years ago. For further trips down memory lane, Cotswold Way is a wonderful walking trail that shows you the area at its finest. Cheltenham is easily accessible by railway or by road along the M5 motorway. Booking a hotel in Cheltenham with AccorHotels couldn't be easier. Simply browse our selection of hotels below and choose one that best suits your needs. Booking online with AccorHotels offers a host of benefits, including our Best Price Guarantee and last minute and real-time room availability.